Milk Lines, Milk Tank, and Cleaning: how equipment is designed to minimize contamination. The milking equipment is really designed to keep the milk clean once it leaves the cow. 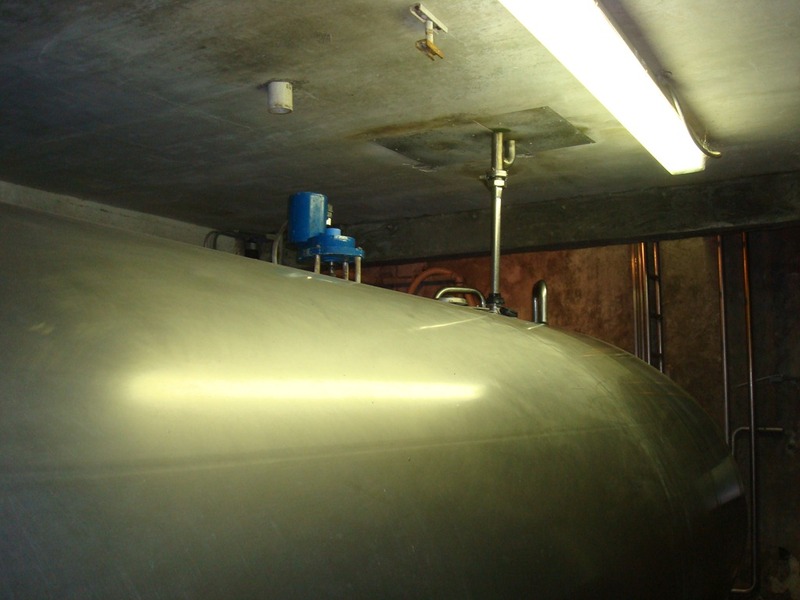 The milk flows from the milking machine to the milk tank in the milk barn by the means of stainless steel pipes. These pipes deliver the milk to the milk silo is a very clean way. Stainless steel is heavily used in any food manufacturing facility, and we use it on the dairy. The benefits of using stainless steel are that it doesn’t rust and it is bacteria resistant. With stainless steel pipes and tanks, there are few (if any) crevices where bacteria can grow and multiply. This is the main advantage of using stainless steel pipelines to move the milk. The milk tank or silo is also stainless steel. The milk silo doesn’t hold the milk for long though. Milk tanker trucks come by the dairy daily to deliver the milk to where it needs to go. The milk silos or tanks have agitators inside to move the milk around. This keeps the different components in the milk from settling out. For example, milk fat is much lighter, and for this reason, the cream will float to the top naturally if there is no agitation. When the cows are all milked, and the milk leaves the dairy, all of the equipment is cleaned and sanitized by means of our CIP system or Clean in Place system. This cleaning occurs twice a day on our dairy, and involves very little manual cleaning noting that the cleaning system is automated. The pipelines, and milk tank are flushed with water first, then flushed with soap to sanitize and kill bacteria, then flushed with acid to eliminate any type of grime or mineral deposits that may have built up in the line, and then a final rinse to make sure there is no soap or acid still in the lines. Cleaning the equipment is important to eliminate the growth of any bacteria that could grow in the milk. One way to eliminate the rapid growth of any bacteria that may have entered the milk is to cool the milk down. 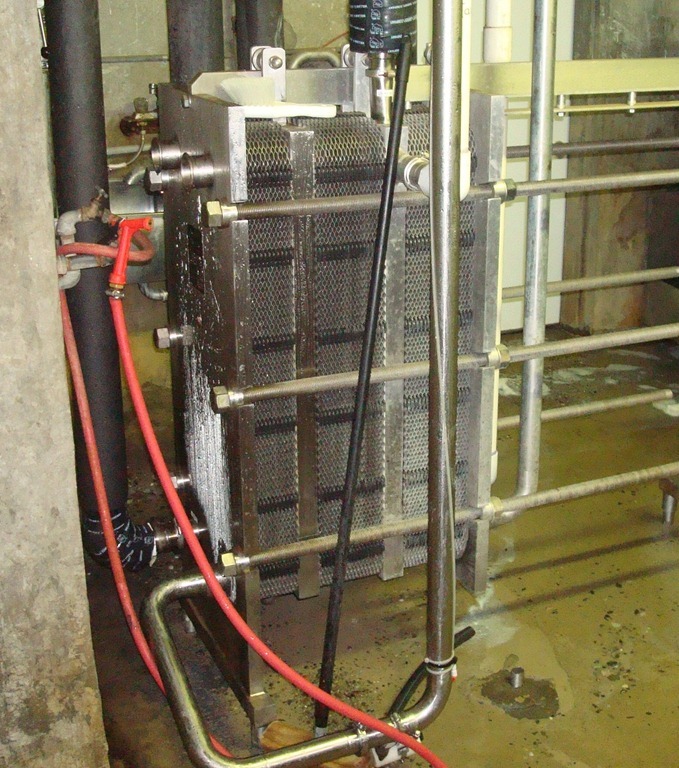 When traveling through the pipelines to the milk tank, the milk is chilled with the chiller to cool the milk down to 40 degrees. The federal law makes it mandatory that we cool the milk to 40 degrees immediately after milking. In order to guarantee that we meet federal standards, we chill our milk to 38 degrees. The chiller is really a fascinating piece of equipment. Cold water that has been chilled passes through thin stainless steel plates one way pulling heat out of the milk as the milk flows on the opposite side. This energy transfer process chills the milk. 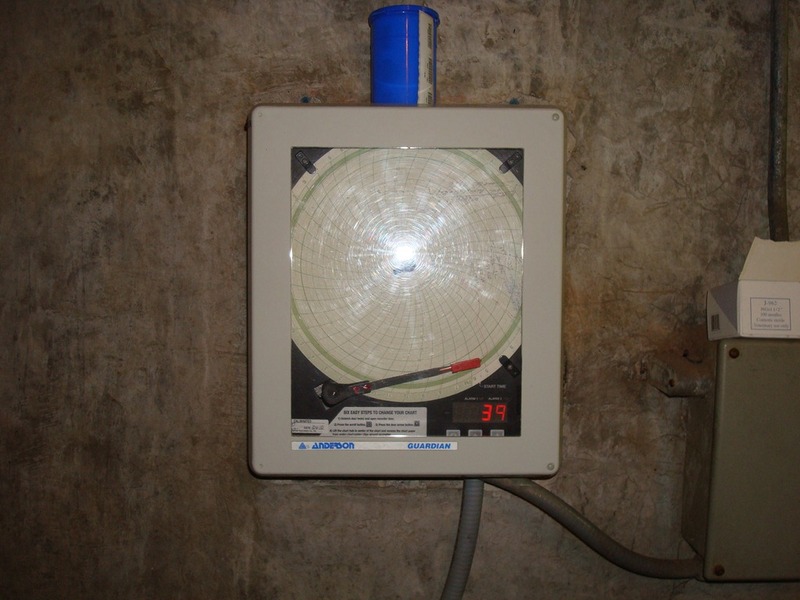 The temperature of the milk is monitored continuously to make sure the milk stays cool, and isn’t sitting at room temperature. The electronic temperature reader is shown in the above picture. The reader displays the current temperature, and also records the temperature on the round chart. The purpose of chilling the milk immediately after milking is to slow down the growth of bacteria. Many bacteria are mesophillic meaning that they grow and multiply very quickly in warm temperatures. When milk leaves the cow, it is at room temperature and perfect for bacterial growth. The many nutrient in the milk make it a perfect medium for the growth of nasty bacteria. This is one of the primary reasons why you don’t want to leave you milk in the car for long periods of time, your milk will turn sour very fast this way. At cooler temperatures, many bacteria are eliminated, and growth of bacteria is significantly slowed. This is one of the ways we keep our milk wholesome. Before leaving the dairy, the milk is checked for antibiotics. Federal regulations say that we cannot ship any milk that is contaminated with antibiotics. All milk that is contaminated MUST be dumped, and is banned from human consumption. In order to ensure our milk is free of antibiotic free, we use a simple test that can detect the presence of antibiotics. This test is used frequently on our dairy, as this is a very important issue. Read my posting on antibiotics here. Milking doesn’t occur with a pail anymore, and there are quality control points on the dairy to make sure that the milk is kept clean and contaminate free. Cleaning the cow’s udders, sanitizing the milking equipment, chilling the milk, and testing for antibiotics are some of the major ways we ensure milk quality on the dairy farm. I hope that these two postings help you understand the process milk goes through from the cow to the milk tank on the dairy, and the various measures that are taken to ensure milk quality. Dairymen pride themselves on producing a high quality product, but they take even more pride in producing a product that is safe, wholesome, and extremely clean. Everyone loves Pizza, is Pizza the New Chinese Food? Milk is so Expensive… Really? Dairymen have Mercy for Animals! Lets eat only natural wholesome food products! Is Modern Dairy and Animal Agriculture Sustainable? No Such Thing as a True Vegan? The U.S. Dairy Industry: On a Mission to Feed the World! Meet the Other Dairy Pets!